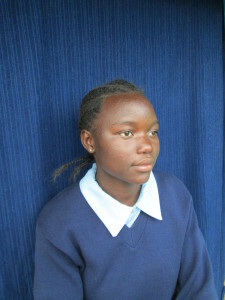 Asha and her family were victims of the 2008 political clashes in Kenya. They were living in Nairobi’s Kibera slum when the trouble exploded and due to tribalism, were forced to run for their lives. They are Ugandan muslims by origin. Their home and business (market stall selling second hand clothes) was burned and the family scattered. Hanne found and rescued part of this family from a Nairobi refugee camp. Asha and three of her five siblings, Deril, Mirium and Robert, were lost and subsequently delivered to the HHFL premises by the Red Cross about a week later. Asha did not go to school prior to arriving to HHFL in 2008. She was kept home to mind her younger siblings while her mother and older sister tried to earn a living. As a result, she repeated two years of school at HHFL. But once she found her footing, we realized that Asha is very bright and keen to learn. She loves school and has worked herself into the top tier of her class. She is very good at English and math. She also enjoys helping the small ones at HHFL with homework, English and math tutoring. She remains a quiet but thoughtful girl. She is a good athlete and excels at volleyball and loves singing. Despite her late start, Asha has great potential.